Il Fiorello Olive Oil Company has two olive groves; one is in Solano County’s Green Valley, and the other in Suisun Valley. Owners Ann and Mark Sievers settled here because the Mediterranean climate is just right for growing and producing their world-class olive oil. Il Fiorello is a local, urban, organic farm, family-owned and operated by Ann and Mark Sievers. We are dedicated to growing and milling the finest quality organic artisan olive oils. Our name, “Il Fiorello”, means “little flower” in Italian. We chose the name for the tiny, white flower blossoms on the olive trees, each of which becomes a delicious olive. Fiorello is also Ann Sievers’ family name, and recognizes the strong dedication and respect for healthy food and farming practices handed down in her family tradition. The Mediterranean climate in Northern California is just right for growing and producing world-class olive oil. We have 13 different types of olive trees in our groves, including varieties from Italy, Greece, Spain, France, and Tunisia. With over 3,000 organic trees, and a state-of-the-art mill, we mill our own olives as well as those for over 200 private growers. We are known for our single varietal certified Extra Virgin Olive Oils from Italian, Spanish, French, and Greek olive varieties. Our certified Extra Virgin Olive Oil blends have also become widely recognized, and equally as popular. 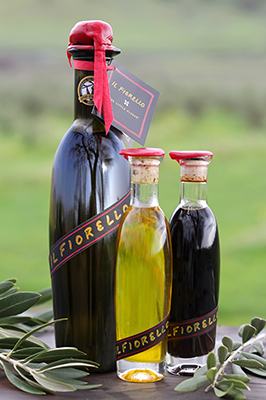 At Il Fiorello, we are dedicated to producing international award-winning olive oils. We have received over 66 awards in competitions since 2009, and in 2013, 2015, and 2017, we were named one of the best olive oil producers in the world. Based on principles of organic, sustainable agriculture, we maintain third-party organic certification of our Groves. We work diligently to keep our farming practices Earth-friendly. Are you an olive grower? We offer custom milling for growers throughout Northern California. If you are interested in having us mill your olives, please contact us as soon as possible to reserve a milling date in the fall. Our modern and technologically advanced mill is one of only about 50 olive mills in the United States, and was produced to our specification by Gruppo Pieralisi, the world’s leading manufacturer of olive milling equipment. For olive harvests of less than 1000 pounds, we welcome small growers to our community milling days, once in October, and once in November. You can find more information here. Our Visitor Center is located on Mankas Corner Road in the beautiful Suisun Valley near Fairfield. Open daily, we welcome you for visits and oil tastings. A selection of wines are available to enjoy in our tasting room, or out on our patio or peaceful grounds. Private and group tastings and tours are available by reservation. During the milling season each fall, we offer olive to oil mill tours. We are open daily from 1-5 p.m. for tastings of world-class olive oil with food pairings, unique balsamic vinegar reductions, and local wines. Guided tours are available by appointment. Il Fiorello Olive Oil Company is located at 2625 Mankas Corner Road. For more information, visit us at ilfiorello.com or call us at 707-864-1529. Hours: Open daily from 1-5 p.m.; tours by appointment only.